If you're in a strange city and get a craving for McDonald's, what do you do to find it? Or say you really need a shot of Starbucks? You look for the sign right? A logo or identifying visual image says "here I am". This is why it is important to establish branding that clearly identifies you and your product line. You want what you are selling to be clearly recognizable to your clientele. If you are an author a head shot is usually a good idea. Your readers would like to know what you look like and be able to get to know you. Your branding might be something more esoteric like style or something concrete like a signature, a theme song, or a slogan. Branding can be many things and you can apply more than one mode of branding. The important thing is to remain consistent. You want your audience to be clear who you are and how to find you. It's important to give them something to remember so they'll recognize you right off. Branding is a science as much as it is an art, and it helps to have professional guidance. But that's not a necessity when you're starting out. You can experiment and see what works. When you find something that works well, stick with it and allow it to become part of your branding. Brianna at Bible Bloggers is branding her blog with the Bible. The Intel 5-tone theme tune. Instantly recognisable. Interesting because I was thinking about branding the other day, especially on how recognisable logos are. I was just reading this week that branding is not just what you present but what people think of when they think of whatever it is you are presenting. Great month already, Lee and its barely thirty hours old. I think I fully understand what branding is now. If you really want to have a successful business then you need to do something that embeds you in the customers mind and puts precedent over everybody else. Intriguing post Arlee, I've learned a lot from this one. Great post. Branding is very important. It's what people think of when they think of you. Guess I need a new pic. Arlee, you're soooo smart. I love to visit your blog. I am bookmarking this one. Thanks for the tip. I need me some branding. Hey Arlee, that as usual is very good advice. People need to identify with the things they want. I suppose it comes down to basic communication! Branding is as much a science as it is an art. So true!! Great statement. One must strike the balance between both, which is not always easy to find. When I had my blog re-designed, the package came with a nice little avatar that I'm using everywhere. I like the consistency. That word makes me want to hide. I've heard it SO much since having books published! But it's true. We wouldn't be recognized without it. I SO agree about branding. I strive for a special "look" for all my book covers that identifies them as mine. we live in a visual society. Make the best of it. I'm still working on my brand. I had a different blog where I thought I was branding myself, but then I decided I didn't want to go in that direction anymore. That's the problem with branding. Sometimes we can't decide what we want to brand. I recognized about half of those brands. Brands become a part of each culture. Great post. I was made aware by fellow blogger C. Lee McKenzie that I've actually sort of branded myself. It was unintentional, but hey, I'll take it. I have to think more about branding. For a writer, it's the name. But how do we get the name out there for all to see? I so think that the sell is the branding. Got the look, sell the stuff. Branding is definitely important to writers (I did 'branding' for my B word last year on my writing blog). Stopping by from the A-Z Challenge, blogging at Ross County Roundup and Write, Wrong or Indifferent. Interesting topic. I don't usually think of branding my blog . . . but I can see where it might be useful. I keep thinking that since my name is fairly rare that it's findable but there are other people with my name on the web . . .hmm. Great idea...my husband and I talk about this all the time with my new book out and what do we want people to remember? Great post! Great post once again. Branding is so important. Even branding in regards to our blogs is important. Super post! Good to know I'm on the right track! Thanks for the shout out! Good ideas, I need a brand. something to think about. GAAAAH I sound like spam. But i mean it, really! I have wormholes as my brand. If people think of me I want them to make the association with wormholes. If they see wormholes on TV, I want them to think of me. Excellent point, Lee, and one of the biggest strengths of A to Z! Well said Lee. I think of branding as a portable litmus test--it should not hinder creativity, but adds to the whole. Very true. But, I never thought about it for my blogs. 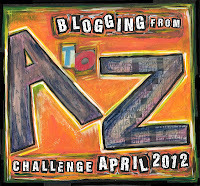 The a-z Challenge is like a little mini-college. It's only the second day and I learned two Swedish words, some facts about China and Norway, and much, much more. I don't know if you will have time to read my comment, AB, but I want to thank you for creating this wonderful connection for all of us. Viva la internet! It' pretty tricky if you write in a variety of genres, i think. I have my work cut out--two names, three genres. But i look at this as a marathon. It will happen. As for A to Z--I have been obliviously promoting for months, all the while assuming I'd signed up... erm... must have forgotten that part, but remedied this morning! I have been giving this a lot of thought lately. This can be tough. I was always dissalusioned when I was young when I turned my book over to see who the person was who actually wrote it. I always invisioned something else. I don't use a photo on my books for that reason. On my blog - it's my feet over my work chair, because I used to do a lot of ballroom dancing. I too write in different genres so it makes it hard. Some images and slogans remain etched on our minds and we tend to pick them out of a crowd. I guess they are good brands with better marketing managers. Interesting post. Great choice for 'B', Arlee. As authors, my writers' group is constantly working on branding - for us as a group and for each one of us individually. I'm not sure that I've been successful at this branding business, but at least I turn around when someone calls me by my author name. I used to keep walking. "Who's that C. Lee person anyway?" This is very timely - I've been thinking about branding a lot over the last few months. I've avoided it for so long, because I didn't know what to do...but slowly, I'm coming into knowing. Branding is so important! Good heavens, you've all started without me, better catch up! Thanks for the tips! 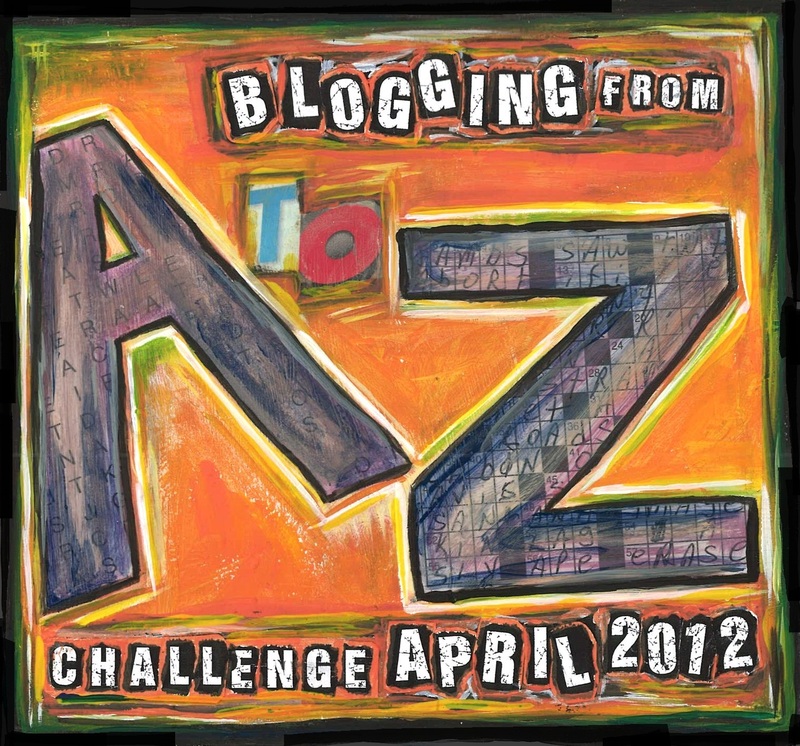 And thanks for starting the A to Z Challenge. I can't believe all the support I've received so far! Hi Lee .. the A - Z brand is fast becoming known ..and a very good one at that .. It's interesting finding that brand name and logo .. excellent tips and post here ..
How true! So many times we refer to product by their brand name not what they are... Kleenex, Q-Tips, etc. Best of luck through the alphabet! As of Sunday my blog, had thirteen posts (yeah the 13th was on Friday). I started it specifically to build my brand and platform. Arlee, you have so many followers it seems silly to leave you a comment that adds nothing to what you have already done, so rather than tell you that after 20+ years in marketing I agree that branding is important, I will tell you that this A-Z Challenge is a hoot! Thanks for the investment. Branding creeps into my head every once in awhile because it is sort of this nebulous thing--to me. I write in all different genres, so branding is a bit tricky. But I realize it is very important in connecting with readers, clients, customers, etc. Looking forward to what I can learn from your post tomorrow! Great blog about branding!! I can think of literally dozens of brand names of things that is the name to everything else like it. I never grab a tissue to blow my nose, I grab a Kleenex! :D I am along for the ride this month on the A to Z challenge and am looking forward to where it takes me. I didn't do well on the logo test, but what fun! This is wonderfully interesting and something I have never thought about. What if you are like me, and are so curious about so many things that you could be considered disastrously eclectic? I don't even keep my hair color the same from month to month! Hi Arlee! Great advice. Thank you. Branding is a very powerful tool, but when is too soon to start branding yourself? I agree that branding is important. Starting my blog was one of the first steps to developing that, even though right now, I'm still not quite sure what my brand will ultimately be because I want to write in a variety of genres for a variety of audiences. So my main focus is to continue developing my writing. Have you read Pattern Recognition by William Gibson (I think I'm remembering the name of the book correctly)? It's about this concept. Not a great book, though. So glad you highlighted Brianna today. Love, love, love her. Very interesting! I guess I think of many people's blog buttons as their branding. Branding is really important for aspiring authors these days! I hate my headshot. Hopefully at some point I can get a picture taken that I'm happy with. I'll probably stick with that one then forever, even when I'm a little old lady! I know what you mean, though. My pic is on my writer business cards and both my blogs. The only place I don't have it is Facebook but if I had an author page there it would be. Personal branding on the internet is going to be absolutely critical for everybody in the not too distant future - even for those who are not selling a product or trying to promote a service or a blog. Think the job market, and things like personal branding such as on Linkedin. It has become more than just tossing your skills out there. Thanks for the reminder, Lee. Branding is definitely an art and science. And when done well in combination can have amazing results! I'm so often leery of advice about things like branding (or SEO, or whatever) from random internet blogs - but given the amazing, clever & recognizable brand of the A-Z Challenge, I'm glad to accept your wisdom & insight on this one! It's especially hard, I think, when working within a preformatted framework such as, well, Blogger -- even though I've learned CSS from creating my website, there's only so much I can do to make it visually adhere. And yet simple things do so much! The Favicon, for example, is in my opinion a hugely underused branding tool -- but sites like Facebook and Twitter have perfected theirs to the point where all we have to see is the Favicon to know what we're looking at. The fact that your blog uses your profile photo is very clever & a great example! I'm enjoying your marketing advice, and am having lots of fun this year on A-Z. I hadn't really considered branding before. I will have to give it some thought. Thanks, Arlee! If only I could be as famous as Starbucks. Great subject Lee. As an employee of a large recognizable brand, it is the essence of the company. Everyone calls a tissue a Kleenex when they all are clearly not. That is the height of branding success. As vital to a writer as to a business. Branding also hurts. Just ask any cow. Just make sure you don't get arrested for talking to cattle, though. Lee, I think that the linky list itself has been removed instead of just closed ... I can't figure out anywhere on who to visit. I just signed on to the challenge, nearly at the last minute, but I'm trying to visit every blog at least once. Great post. I wonder what friends think of when they think of me. I have no brand ... and I can't imagine what it would be if I had one. I actually look for it up on navigation in my phone... but of course... without the signs I would never find out where it was. thanks for the info--guess it is a good thing i recently put up a head shot of myself! Never thought about the importance of 'branding', but I realize how much I depend on the simple logo or such in shopping, advertising. Symbols stick in my head more than written titles. I would like to email this post to my niece who is starting an online business. Branding is important and I think I've gotten a good handle on it. Good post! Good B word, Lee. Very informative. Branding is good for writers. I've branded myself a memoir writer. So there...And you have many brands, including memoirist, all of them very interesting and informative!! This really got me thinking of how many brands I know simply because of a symbol or song. There are so many! Great post, such an interesting topic. Great, sound advice. In the same way, our blog name can also be turned into our brand. Thank you for an interesting post. I was in London at the week end & was mulling this subject over as I walked past Starbucks & other shop signs. Sometimes I can feel so trapped by what I chose to be the brand of both my blog and podcast. I'm in the process of redoing my blog and pinpointing the branding. Great post. Branding is very important! It is why some things are successful and others aren't. Good branding speaks volumes... great post!